Oneida, Old Hall, Viners, Wedgwood, Sant'Andrea, Gense, George Butler, Guy Degrenne, Royal Doulton, Arthur Price etc. Probably the largest stockist in the U.K.
Cutlery for sale is either 'new' or in a 'good used' condition. As with all our discontinued cutlery we have no idea from where or when we will be able to replace stocks once they are sold, so please do not ask for a discount. Our problem is not selling discontinued cutlery but sourcing it! If your pattern is NOT shown, to help us to try to identify it, please click on e-mail address: sales@cutlerysearch.com and send a .jpg image (no larger than 640 x 480 pixels) of a knife, fork and spoon together with the wording on the back of a fork. We also buy new or second hand cutlery in very good condition. 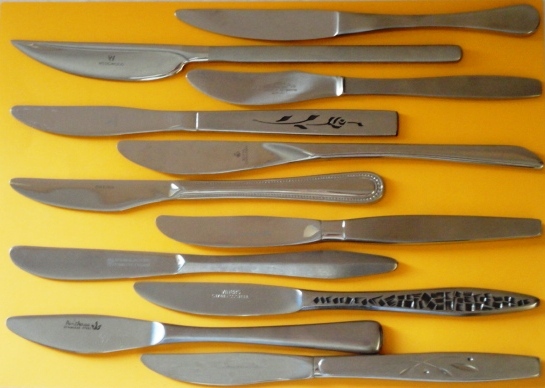 Please e-mail the maker's name, pattern name of the cutlery, list of pieces and quantities available, plus an image. If anyone needs to see how efficient a company is then look at www.cutlerysearch.com. Excellent communication from you via the website, clarity, sufficient details with an easily understood ordering process and a very extensive range of cutlery. From first viewing of site on sixteenth March, making order, then payment, to receiving the goods today 20th March all without the slightest problem that is the best example of service and satisfaction that you can ever have. The bonus is that the cutlery losses experienced during a house move which we were uncertain about was sorted in five days total in contrast to months and months of checking boxes and the removers which was frustrating and time wasting without a result. Congratulations Cutlery Search may you go from strength to strength.